When you think about slate roofing, you probably imagine uniformly-arranged gray or black rectangles on imposing sloped roofs. 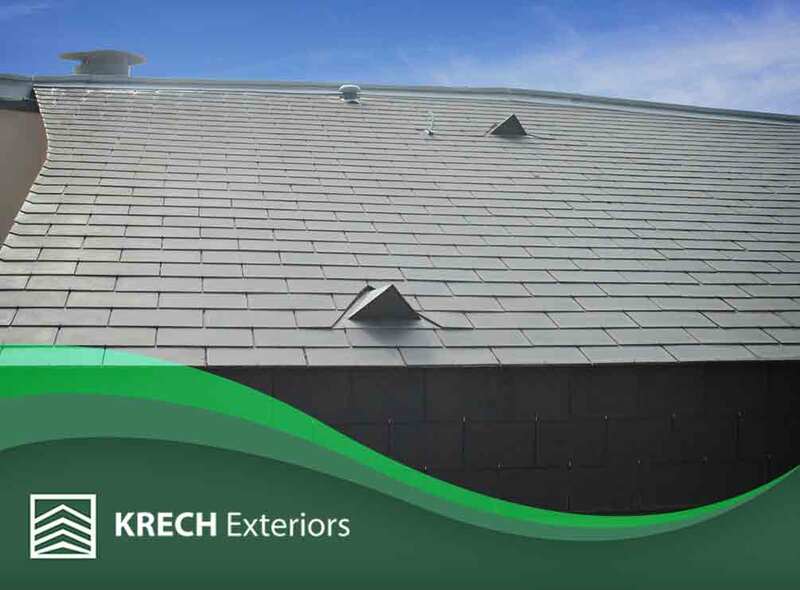 But, you might be surprised to know that slate can be installed in many ways, and in this blog, Krech Exteriors shares a list of the different installations that can be done with slate roofs. Standard – The most common slate installation pattern is comprised of 1/4- to 3/8-inch pieces of uniformly-cut slate. Standard installations are symmetrically arranged like asphalt shingles, which allow for easy repairs. Patterned – Slates of different colors and/or shapes can be introduced into the standard installation method, which can be used to create patterns that can be seen from the curb. Patterns can take the form of geometrical shapes or even names. It takes a skilled roofer to install such patterns as the slate still has to fulfill its basic function – protecting the building on which it’s installed. Random Width – Random width slate roofs feature slate with the same height and thickness but in varying widths. This adds a rustic look to an otherwise typically symmetrical roof, but it’s not as complicated as a patterned slate roof. Multi-Colored – Natural slate comes in many colors, from pale gray to brick red. Multiple slate colors add texture to an otherwise uniform-looking roof. Skilled roofing contractors can ensure proper color distribution so the roof doesn’t have spots of a single color. A gradient effect can also be achieved by grouping the slates per color. Graduated Length – Slate didn’t always come in uniform sizes as they do now. Back in the day, roofing contractors just got their supply of slate and sorted them on-site. The longest and widest slates are installed at the first row, decreasing in size until the shortest and narrowest slates are installed at the top. Slates with varying thicknesses require that the thickest ones be installed first. Textural – Textural slate roofs are the opposite of a standard installation. Slates of varying thickness and size are used, resulting in a rough appearance. It takes a skilled roofer to build a textural slate roof without compromising its performance. If you are looking for a skilled roofer who can install any of these slate roofing styles, call Krech Exteriors today at (651) 968-8888. You can also fill out our contact form to schedule a free in-home consultation. We serve Minneapolis and the surrounding areas.